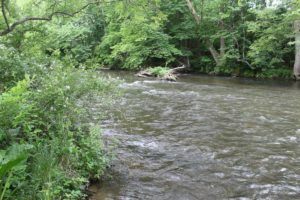 Working for the coldwater conservation organization, Trout Unlimited of which Trout Scapes is a TU Business Member, we recently restored a 1/3 mile reach of the Musconetcong (Musky) in northwest New Jersey on state owned land between the towns of Asbury and Bloomsbury. 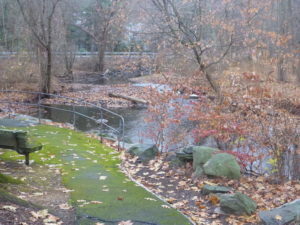 Most of the water up and downstream is in private hands, but this section is owned by the NJ Division of Fish & Wildlife and maintained as public fishing access for trout. 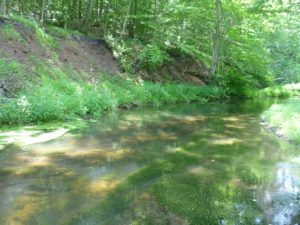 This work was funded by William Penn Foundation, Theodore Gordon Flyfishers, a Trout Unlimited Embrace A Stream (EAS) grant, as well as contributions from 7 NJ based TU chapters. The project lead is Cole Baldino, TU’s NJ Delaware River Coordinator and TU national staffer working to protect and restore NJ trout tributaries to the Delaware River. This property had once been leased to fishing clubs, and the clubs were fond of building stone dams to try to create deep pool habitat. Instead, the dams got “pushed down” by flows and that allowed the water to flow towards the banks, widening the river by as much as 44′ in places. 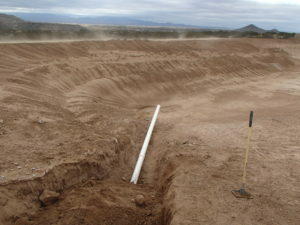 Point bars adjacent to newly restored pool habitat act to narrow the flows back to normal which for this reach is between 65′ and 72′ in width. Not only will anglers benefit, but so will paddlers as this is a popular spot with canoes and kayaks. 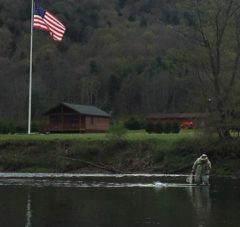 Trout Scapes River Restoration LLC is pleased to announce that we will be working in Connecticut on two new projects. 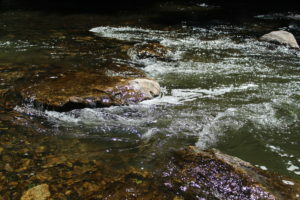 Connecticut is home to native brook trout as well as wild brown and rainbow trout in most of its major drainages. 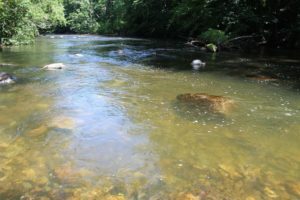 Trout Scapes will be restoring a tributary of the Housatonic River, the Pootatuck River, in Newtown, CT and performing survey and design work on nearly one-half mile of the Norwalk River in Wilton, CT ahead of restoration construction as early as summer ’18. Both projects are on public lands, and both projects’ clients are watershed and conservation organizations working hard to protect and restore coldwater resources in that state. 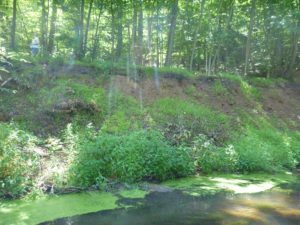 The Pootatuck project includes root wads to restore two sections of eroding banks while creating deep pool habitat for summer thermal relief for native brook trout. 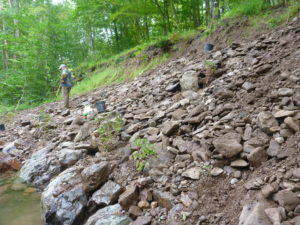 Trout Scapes will use soil bioengineering techniques on the banks and bed manipulation in the river bed to restore this section of the river above the Deep Brook tributary. Work is tentatively slated for summer ’18. The Norwalk River’s Schenck’s Island section in downtown Wilton, CT is already popular with anglers, dog walkers, bird watchers, and other visitors. A portion of this section of the river is owned by a local land trust with the town owning the rest of this stretch of .45 miles. This river is both a trout stocked and wild brown trout river, and it suffers in locations from man’s impacts including stormwater runoff, building too closely and within the floodplain, channelization, obsolete dams, and tree and shrub removal to list a few. Restoration of this section will showcase the river in the town once a formal design has been created and permits have been approved, hopefully by summer ’18. 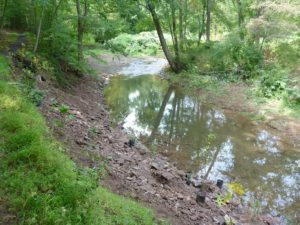 TSRR was invited to bid on and ultimately won the restoration of a badly eroded bank along the Capoolong Creek, a wild trout stream in Hunterdon County, NJ by the Division of Fish & Wildlife who own this property. The old railroad bed perched above the creek is a popular hiking trail onto state lands for hunters, anglers, hikers, dog walkers, and horseback riders, and the trail was being eroded away with no place to relocate it as it abuts a private property and not other state lands. 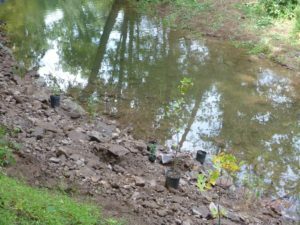 The project consisted of arresting future erosion by refocusing the river’s energy away from the bank in high water, restore some of the lost material to the bank, plant it with native trees, shrubs and seed mix, and allow the state to do additional work to restore the trail itself now that it will no longer erode into the stream below. The slope of the eroded bank was covered in invasive Japanese stiltgrass which dies off in winter and does not have a root system to hold soils in place. 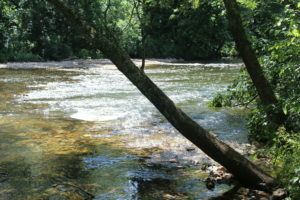 The river’s energy was redirected off the right bank (looking downstream) and large boulder barbs were buried under what appears as a normal bank that will push the high flows off the right bank and into the deep pool, scouring the pool and lessening energy that could damage the bank further. 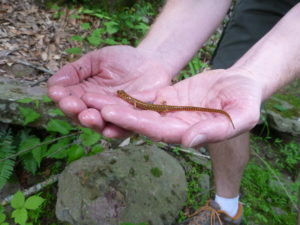 During the permitting process, a state threatened salamander species was found to be on site, and TSRR worked with Division biologists to not only keep them out of harm’s way during the construction phase of the restoration, but we also incorporated some of their habitat needs into our final design. 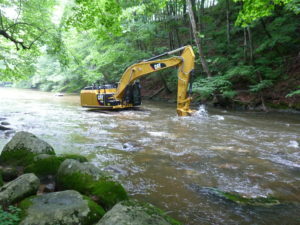 Wild brown trout began moving into the newly restored pool as heavy equipment was leaving the site, and we watched as one of the trout rise consistently upstream in a pool above our work, seemingly oblivious to having an excavator working 50 yards downstream. BELOW: a tough planting location! Below: the finished product minus seed sprouting…. 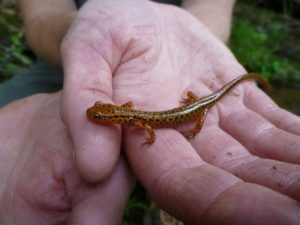 The NJ Division of Fish & Wildlife will monitor this species of salamander throughout the reach sampled for this project to see if numbers increase and to see if the restored bank is now good habitat for them as the exposed banks had not been previously. 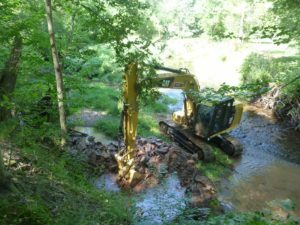 The three of us had a small part to play in these restoration projects while in our former roles and it is great to know that shad and striped bass are back in a watershed they haven’t had access to in nearly 300 years due to old mill dams. This is exciting news and demonstrates clearly the positive impacts of removing obsolete dams on our rivers and streams. 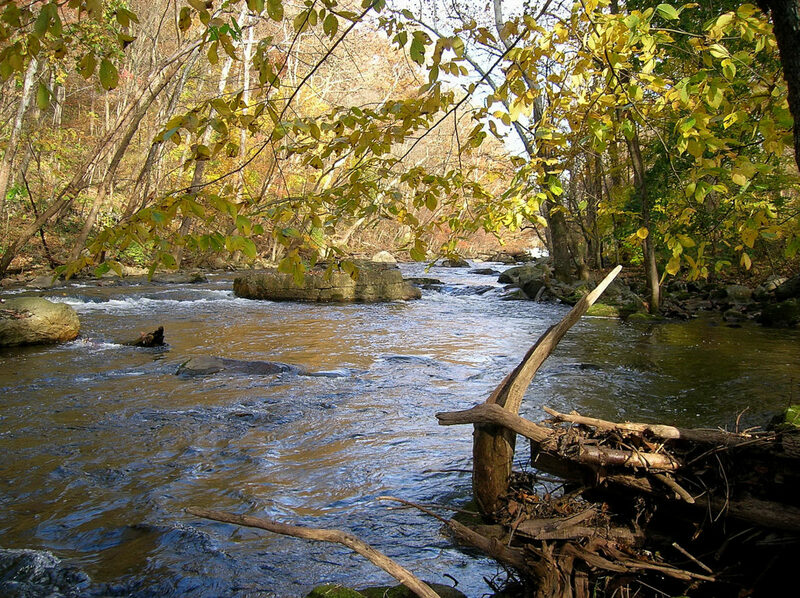 Trout Scapes River Restoration LLC is working in the Musconetcong watershed in northwest, New Jersey. 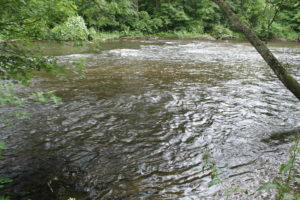 The “Musky” as it is locally referred to is the NJ Highlands region’s longest trout river at 42 miles from its headwaters at Lake Hopatcong southwest to the Delaware River where it supplies millions of PA and NJ residents with drinking water downstream. The Natural Resource Conservation Service (NRCS), a part of the US Agriculture Department charged with conservation funds from the Farm Bill, has recognized Eric Werhand from Trout Scapes River Restoration LLC as a certified Technical Service Provider (TSP). Trout Scapes can work with clients in many states to perform survey and design services for in-stream restoration with a large portion of our fees being refunded to our customers that are funding their restoration projects with Farm Bill funding programs such as EQIP (Environmental Quality Incentives Program) and other NRCS funded programs. These same programs also provide significant and often complete funding for in-stream restoration projects. Contact Trout Scapes for more information if you are considering a Farm Bill program to help fund your project. Technical Service Provider Certification TSP-16-21605. And……..we’re off to the races! Having recently launched as a new river restoration and pond building firm with decades of experience between our team members, we have quickly become busy with new projects across the country. 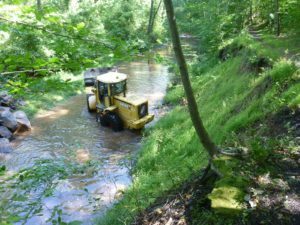 Our river channel restoration projects are not only focused on creating and enhancing trout habitat, but are aimed at building resiliency into those rivers and streams to face the ever increasing climate changes that are leading to heavier rain events. 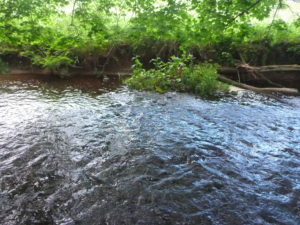 Those high water events are tearing up stream banks and incising the channel, disconnecting the streams and rivers from their floodplains and further degrading aquatic habitat. By reconnecting the floodplain and moving the channel’s energy off the banks while restoring those eroding banks, our projects are improving the ecological function of the entire riparian corridor. We also enjoy the design and construction of recirculating pond systems and the associated fish habitat they bring to our clients. 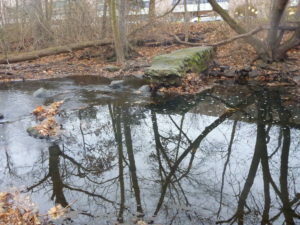 Here are some of our new projects in various phases of planning up to and including construction: 1) private 1 acre recirculating pond in New Mexico under construction, 2) bank stabilization and in-stream restoration on the North Branch Raritan River in New Jersey, 3) bank stabilization and in-stream restoration on Capoolong Creek, also in New Jersey, 3) in-stream restoration of a one mile section of trout stream in Loudoun County, Virginia, 4) in-stream restoration and bank stabilization to 1/3 mile of the Saddle River, in Saddle River, NJ 5) two new ponds in/near Bozeman, Montana, 6) 2/3 mile of the Wild & Scenic Musconetcong (Musky) River for in-stream restoration, 7) design, permitting and construction of a private pond in Somerset County, New Jersey, 8) removal of the Burnt Mills remnant dam on the Lamington River in NJ along with 2/3 mile of in-stream restoration, vernal pool creation and floodplain reconnection, and many other projects still in the early planning stages for 2018 and beyond.